If you are reading this blog, you should know by now that we are going to be at the Fancy Food Show, at the end of June. Booth #2949 (read here for more). It is our great pleasure to share our booth with our friends of the American edition of La Cucina Italiana magazine. La Cucina Italiana magazine is an offshoot of the Italian “La Cucina Italiana”, which is the oldest cooking magazine in Italy (in the world? ), being published since 1929. Many editors in Italy ventured to copy the concept and format of the magazine. 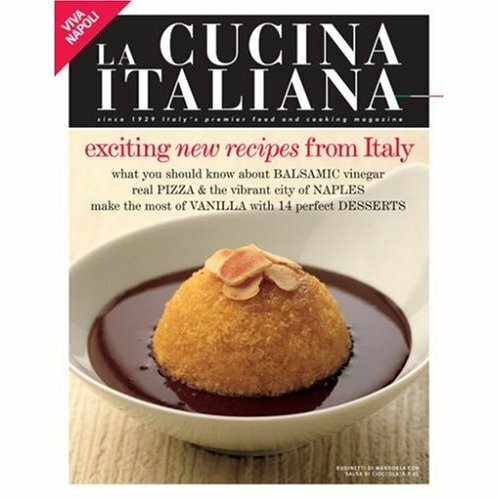 La Cucina Italiana keeps its strong position, more than double the distribution of the next similar magazine. The other day, I was talking to Jacopo, the descendant of the Italian founders who transferred to NY to oversee the American magazine. He told me that one of the factors that make the magazine so successful in America is that it is authentic and all the recipes are developed in Italy, in the main office in Milano. We love the magazine and always read and use it, as our mothers did in Italy. Like Gustiamo, the magazine is the real thing, when you talk real Italian Food. During the show, the chef Antonio Cinicola will cook recepies of la Cucina Italiana with authentic Italian products from Gustiamo. We will post all the recipies on our website, here is the first: Pasta with Tomatoes, Olives, Anchovies and Capers. Buy any or all of the ingredients included in the recipe and you’ll receive a discount of 20%. This offer is valid until July 15 (or until supply lasts) and the magic word is “CUCINA”. You have to write “CUCINA” in the special instructions of your shopping cart, in order to receive the discount. Lots of reasons to stop by our booth #2949: meet our friends from La Cucina Italiana, taste authentic Italian foods and grab a free copy of the magazine. See you there. I am in euphoric as I read that the recipes are really REAL and AUTHENTIC. I do buy ALL the issues of the magazine because I love to cook Italian foods. Sarah, thanks for your comment! We love that you are a fan of both La Cucina Italiana and Gustiamo.